We love the down home atmosphere of the Cottage Restaurant on Lincoln Street, next to the Wayfarer’s Church, in Carmel, California. The owner is always present and a very pleasant lady who likes to take the time to talk to the customers. 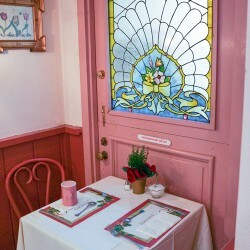 The restaurant is larger on the inside than it looks on the outside and our favorite table is just a table for two in a corner close to the entrance. I think this restaurant has to be noted for their great Artichoke Soup. We look forward to eating at this restaurant on all our trips to Carmel and it’s the Artichoke Soup and the Caesar Salad that we order. The Servers are always very informative about the daily specials and everything on the menu and they are very prompt in returning to check to see if we need water or anything. Yes, I would, HIGHLY, recommend the Cottage Restaurant for honest to goodness real home style good cooking at a reasonable price. I’ve heard this is where the locals eat. I’m not a local, but we stop in to eat there on every trip to Carmel. The restrooms are small and off of the kitchen, but they are clean, so that’s perfect for me. 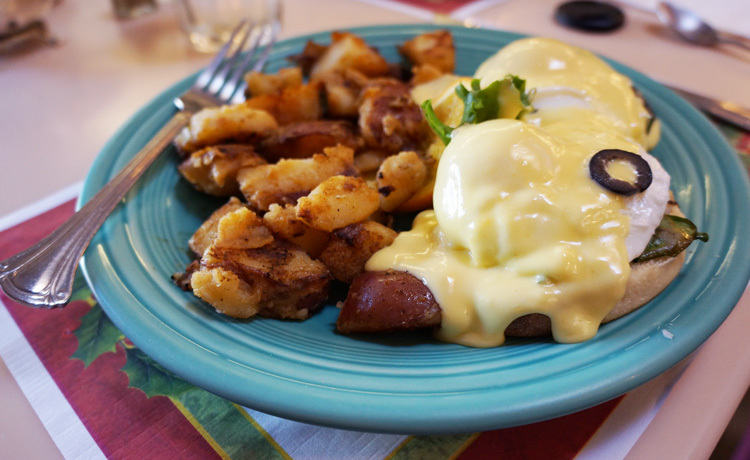 Chicken Avocado Eggs Benedict – S.K. This is the one restaurant that I absolutely visit once every day when I’m in Carmel. The food is spectacular, there is nothing on the menu that is not AMAZING. Speaking of menus, ask your server for a copy of the “secret” crepe menu. The spinach, mushroom, and onion crepe is sublime. 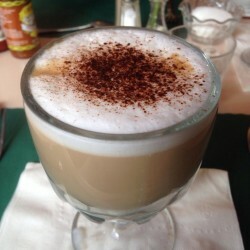 The atmosphere is cozy and the service always excellent. I honestly can’t say enough good things about this place. 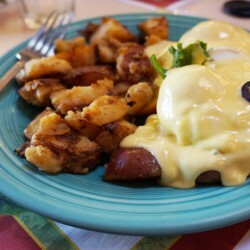 The best place for breakfast and lunch in Carmel! Breakfast is served all day! Veggie sausage is delightful and their latte is delicious! I come here every time when I’m in Carmel! We have been here a total of 4 times now, so that should be a dead giveaway about how great this place is. Such a quaint restaurant, which offers seats by the fireplace and window (which is lovely in the morning). The breakfast menu offers a wide variety of items, if you get the omelet (recommend) or breakfast burrito, you can choose any 3 ingredients. 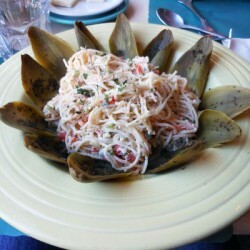 The service is always excellent and friendly, the food is just as great, and the setting is wonderful. 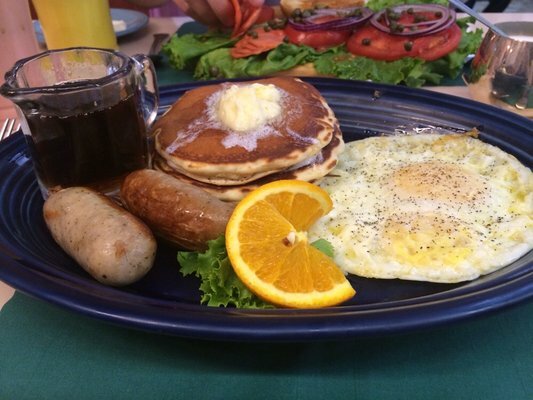 If you want the best breakfast in Carmel, come to the The Cottage! My wife and I came for lunch. We have been to the Cottage before and already knew the food was good. The Cottage is quite literally a cozy cottage. We were seated by the fireplace with what I think was a wood burning fire. 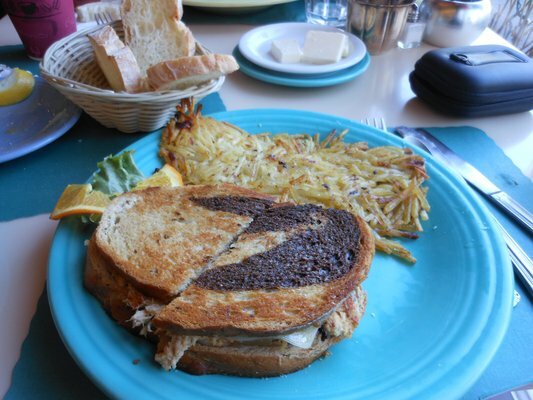 My wife ordered a bowl of artichoke soup, pumpkin muffin, and the tuna melt on marbled rye and had hash browns substituted. I ordered a bowl of artichoke soup, side of hash browns, and the crab pasta. Everything was great. Before the food was brought out, we were given fresh bread with butter. The artichoke soup is award winning and is so for a reason. It is finely pureed, but somewhat thick and has a fantastic flavor to it. The pumpkin muffins are very soft and great with butter spread over them. 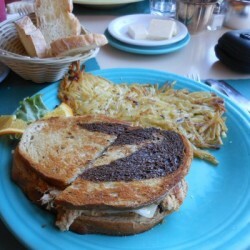 My wife tells me that the tuna melt is very good, and has ordered it in the past. She said it was “fresh and flavorful”. 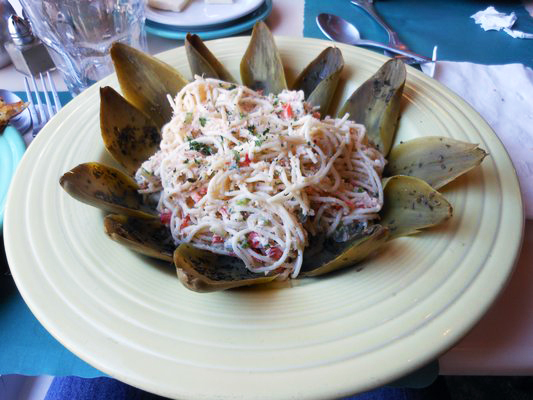 The crab pasta had a light, crab flavor to it but was not too strong or fishy tasting. The flavor was a little light for me, personally, so I don’t plan to order it again. On the other hand, my wife, who doesn’t like crab much, thought it tasted very good. So basically it is good pasta but with not much crab flavor. The hash browns were very good. Sometimes some places under cook hash browns, but not here. They were as I was hoping. So if you want a great American breakfast or lunch for a reasonable price in a pleasant, cozy setting, The Cottage would be a great choice. Eggs Benedict with Lox – L.E. This little tourist town is so cute! Artichoke soup (we had a lot of artichoke that weekend must be in season) it was good and thick. I think it was cream of artichoke so you can imagine. 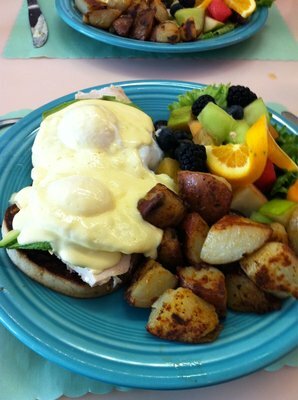 My husband, 5 kids and I went to breakfast at the Cottage Restaurant and really enjoyed our meal. Prices were reasonable and service was friendly. My kids (ages 7-17) ordered a variety of items and everyone liked everything. 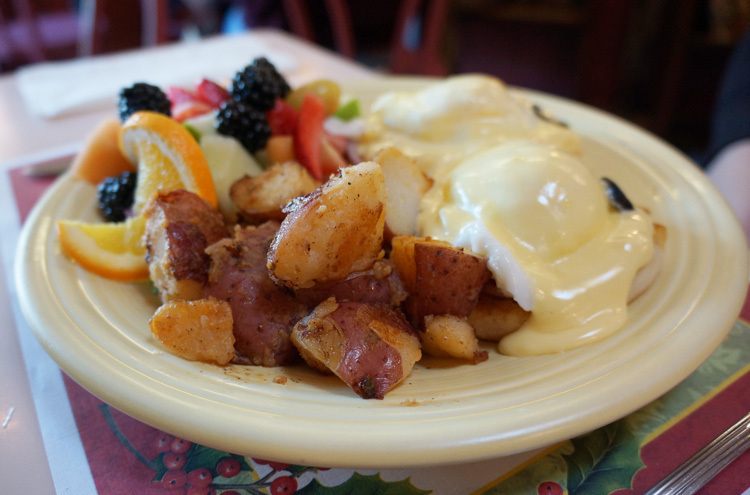 We would highly recommend Cottage if you are looking for a low-key, quaint breakfast spot. 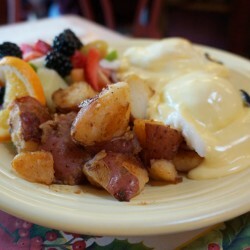 Carmel isn’t a one dollar sign kind of town, but we were in the mood for a simple breakfast. You know, just the greasy goods needed to soak up the remaining drops of wine from the night before. The Cottage seemed like the most straight forward of the two dollar sign options so we chose it, and I’m sure glad we did. It was indeed like sitting in someone’s cottage. The clientele varied from families with small kids running about, tourists to really, really well dressed retirees. You know, Clint Eastwood’s besties. 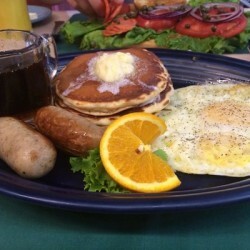 I had their basic breakfast with eggs, tiny pancakes (dubbed Kathy Cakes) and bangers. It tasted good and was affordable and the bench I ate it on had a pillow on it. Win win win. We were just walking around Carmel and decided that we wanted some lunch and found this place. It looked cute from the outside and comfortable and it was. I think this was an older home converted into a comfy restaurant. We were there for a easy but light lunch and The Cottage fulfilled our every expectations. I am on a gluten free life style and that was no problem here. I had there bagel with cream cheese and lox but without the bagel. It was not gluten free. They displayed everything so nicely on my plate (which was actually a wooden cutting board, very cute) but the best part were the lox. It was sightly smoked and very, very tasty and they were so generous with the portion. Everything was fresh and I believe my husbands eggs were fresh farm raised eggs because the color of the yoke was so beautiful. 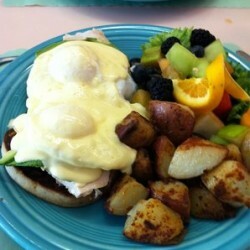 If you are walking around Ocean and 7th in Carmel you must stop here for breakfast/brunch. Oh forgot to mention the service…it was excellent! Very friendly staff. Food was a 4 to 4.5; service put them over the top. We were treated like valued guests and made to feel welcome. They obviously cater to the customer, and a key word that many businesses fail to recognize, flexibility, is written all over The Cottage. 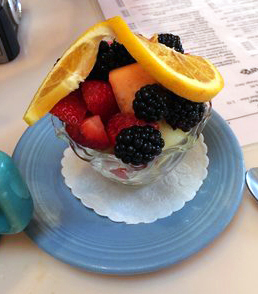 Many places offer fruit instead of potatoes for a breakfast side, but how many offer half fruit, half potatoes? That may not seem like a big deal, but it’s emblematic of their attitude at The Cottage. They prepare food the way you want it. Wow, it’s the best breakfast & lunch place I’ve ever been to! 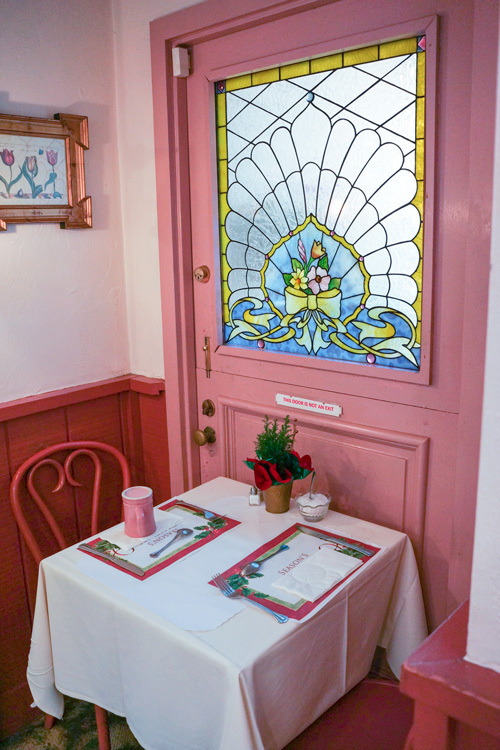 The interior is so cute– benches, pictures, floral patterns. It’s the perfect date place! Love their French Toast on the egg bread, and I love their fresh squeezed grapefruit juice. I really enjoy everything I get there, and I hear their artichoke soup is the best in the county (though I’ve never tried it myself). The reason it only gets 4 instead of 5 stars is that when it get’s busy they are slow to get the food out. Not their fault, but last time I waited 45 minutes and that was a bit longer than I was hoping to wait. I go every time I’m down and I will continue to. Even the girlfriend likes it, and with her allergies that’s not always the case. So keep being delicious! This place is a wonderful and delicious hole in the wall. It is literally a cottage and it has seats inside. My husband and I stopped here for breakfast after taking the 17-Mile Drive. We sat in a little corner table so we could take in the whole restaurant… there is a small fireplace and may of the bench seats appear to be repurposed church pews. I ordered eggs and bacon, the bacon was AMAZING… the whole meal was really. They only had raspberry preserves or orange marmalade. If you like them, yay for you! I typically only like peach and strawberry. Their coffee was great, they even gave me a to-go cup for the road since we were driving back to LA. My only qualm with the coffee was that they only have sugar, no Splenda. Not a big deal, just figured I’d let you know. 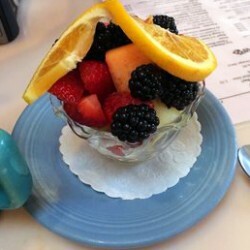 Overall, the food was amazing and the service was great, a real at home feel. Worth the stop, especially after the 17-mile drive, that trip certainly works up an appetite. Everything about this place screams brunch. 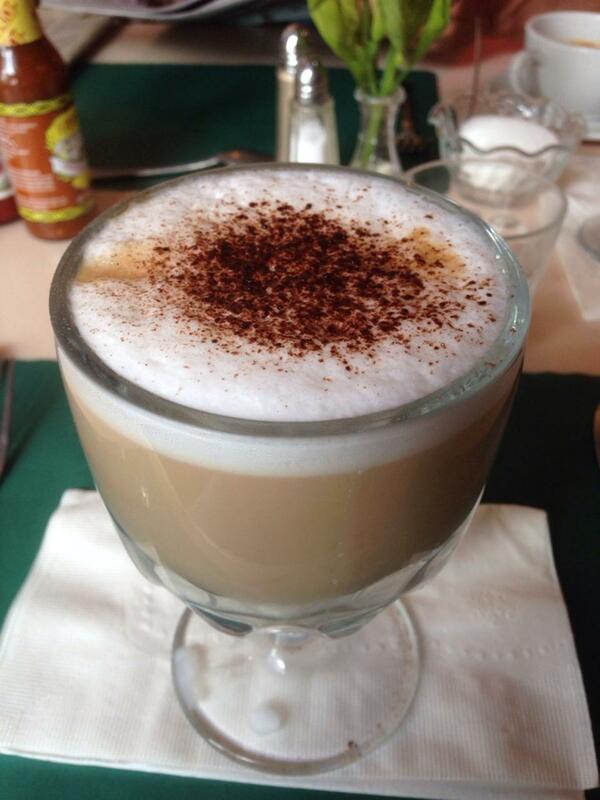 Breakfast served all day, great friendly service. Rustic cottage feel just as it promises. Cozy fireplace, pillows on the benches. The ambience is really what makes this place. The perfect lunch stop. We were directed there by two kind ladies on the street when we asked for a nice place for lunch. Both love this place and have frequented it for 25 years. No ones more reliable than locals! We too now LOVE this place. The atmosphere is warm and inviting with a warming stone fireplace and large windows to view shoppers. The me use is extensive and very reasonably priced. The service was very good too. We stumbled on The Cottage Restaurant after poring over menus for overpriced, and way too precious, Carmel restaurants. Sure, it’s a tourist town, but we figured there had to be some place friendly, affordable and comfortable for lunch – and this was it. The artichoke soup lived up to its reputation, the chicken salad had big fresh chunks and lots of goodies, the individual pizza was hot, fresh and the crust just right. Salads were big and fresh, coffee hot and just strong enough. The wait staff and hostess were charming and attentive without fussing. The restaurant has a warm, homey feel and decor, with a little fireplace, too. A don’t-miss. Best Buckwheat Shortstack around ! Cute Breakfast spot in Carmel, decor is done cottage style. Tables and chairs and a long pew style booth along one wall with comfy pillows facing dining table. Fireplace in corner makes this a cozy place for breakfast while visiting Carmel. Locals seem to visit early for the good coffee and food. Friendly service, opening early is a plus for those of us visiting from the Midwest.